The New Jersey Vegfest seems to have done quite the overhaul within the past year. From their humble beginnings at the Hyatt Morristown ballroom to totally taking over the entire Meadowlands Convention Center this year. While also hosting several vegan pop-up shops all year long, all over New Jersey. My biggest criticism of the 2016 event was how small the location was, so I’m glad that wasn’t an issue this year. It’s great when Vegfest has done so well they need to move into a larger space. After a quick ride up the Parkway, I arrived at the convention center with little direction on where to park. I searched for a specific sign that may have told me the best parking for the convention entrance. Unfortunately I didn’t see that or an awesome “VegFest Parking” sign that would have been helpful. So, I ended up parking in an empty parking lot of an office building down the block from the covention entrance. Not sure if any others had a weird parking issue like me, but I was so glad to not have to pay for parking or need to be reimbursed for it (like last year). After that, the event was off to a pleasing start! 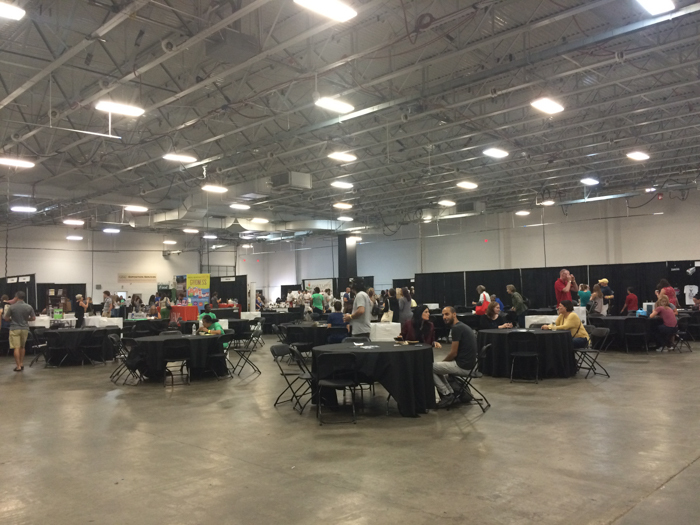 Since VegFest had the run of the entire building this year, it was easy to find where I needed to be in the building. There was no confusion this year, in comparison to last year at the hotel. I aimlessly wandered a lot less this year. By the time I entered the building at 10:30am (the doors opened at 10:00am) the ticket line snaked its way around the lobby area. It was a very long and discouraging line to look at as soon as I arrived when I was so eager to get in to check out the vendors. It seemed that every attendee needed to stand in this massive line and then had the option once they arrived to the front of the line to head to the pre-sales or on-site ticket sales. Like other expos I’ve been to, I think they should have two separate lines. I feel as though some stanchions would have helped the situation also, to snake the line even more compact. Adding a few volunteers at the door if two ticket lines are added would be really wonderful to streamline. Overall, despite the very long line, it did seem to move quickly and was non-existent when I left the event at noon. Once I entered the main floor, it was easy to tell that New Jersey has lots of strong supporters of veganism, companies and patrons alike. The room was setup really well with lots of tables for eating or just taking a break. To my surprise there was a live musician strumming his guitar on stage. His music was really peaceful and chill to enjoy while walking around and reminded me of the band Dispatch, unfortunately I didn’t catch his name. At the lecture stage there was room for 600 seated attendees and an additional 150 standees, which really surprised me. This entire area was totally packed when I popped my head in so I could snap this photo. It was really good this year the event planners included all of the lecturers in the general admission fee and only for a small increase in price this year. I believe that is the best way to do it, mainly because if someone wasn’t inclined to attend one of the lectures, perhaps they would now that it wouldn’t be extra money. 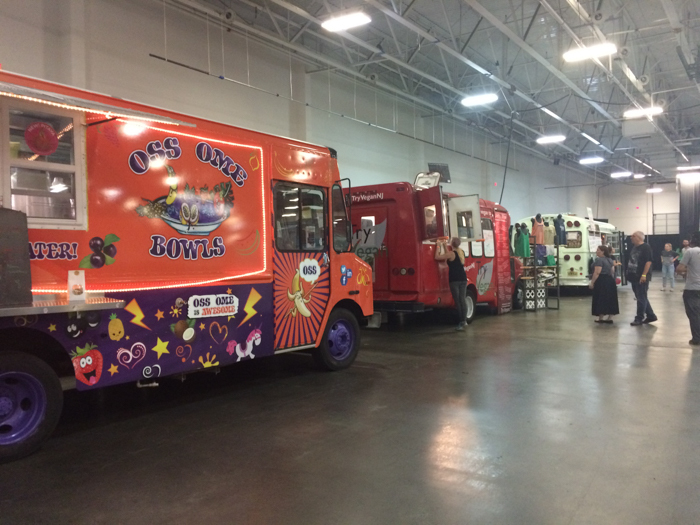 I really loved seeing food trucks indoors! It was so fun and gave the feel of a vegan food truck festival too. Most of the trucks could be found on the left side of the venue, along with one of the trucks being parked outside. However, the one food trucks on the right side seemed to have just been parked in that area because of the lack of room elsewhere. Having that truck there tended to clog up that area and narrowing the walking area. I’m not a person that enjoys crowds or fighting to get through them, so I avoided that bottlenecked area most of the event. Elsewhere at the event the aisles were much less crowded thanks to how widely they were setup. When it comes to space, you can’t ever seem to have enough between rows of vendors. Attendees tend to hangout to learn about products, which then narrows the area to pass in-between when they are checking out vendors on both sides too. This year was a tremendous improvement from the space available last year. Now to share some sustainable observations of the event, I was really glad so many vendors who gave out food samples had compostable containers. There was one food vendor, Eat Nice Food who was awesome by having paperboard sample cups but then had really durable plastic forks shoved into the food samples. Their ravioli samples were really tasty, I just wish they gave me the chance to use my own utensil – which I was able to specify I had when I ordered at Marty’s V Burger. 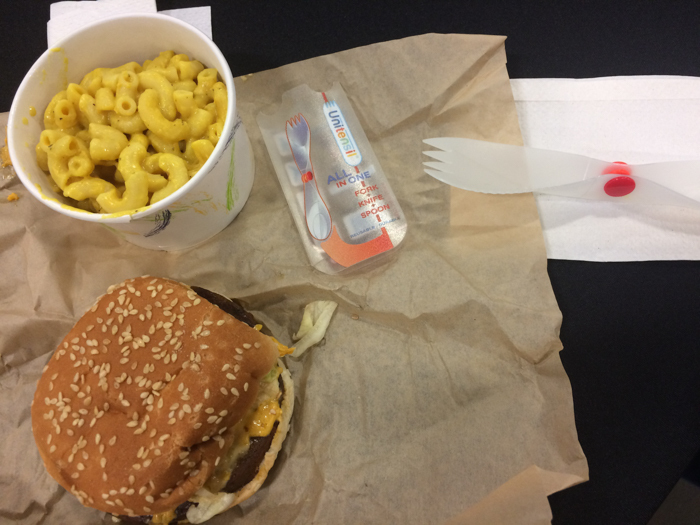 Marty’s V Burger was the other vendor that I visited which I ended up creating trash because of, a waxed paper cup from my Mac and Cheeze. I would have loved to see more vendors with wooden utensils for samples, like Om Sweet Home did with their non-dairy butter alternative. 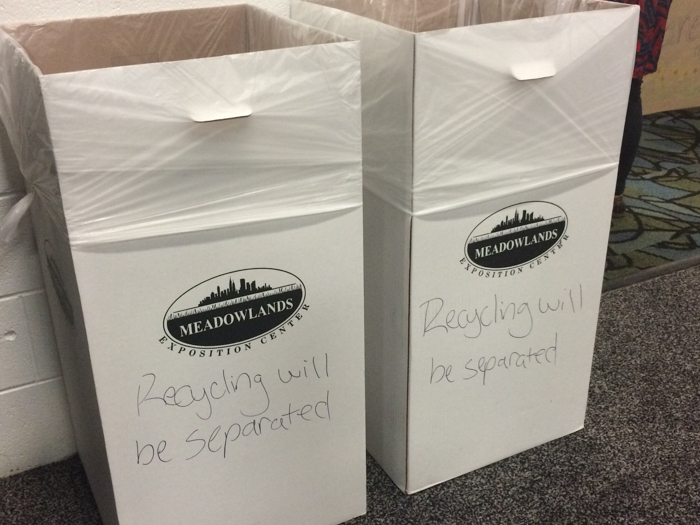 It was really great that even though the event didn’t have any separate recycling bins, one set of bins at the entrance to the main floor did have handwritten “recycling will be separated.” Though would it have been that challenging to have that second bin be an actually recycling bin? I wonder if having compost bins would have been too much to ask? 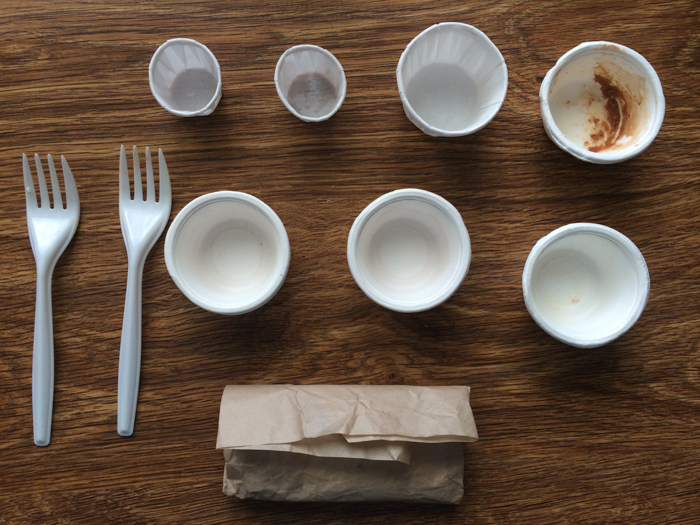 It didn’t matter entirely too much because I’m the kind of gal that will happily take my compostables (which I did) and recyclables home to properly dispose of them – not everyone else is willing to do so. There were so many vendors that might have had really great products but I was very turned off to their products because of its packaging in plastic in some way. Vegan chocolate and peanut butter cups wrapped in plastic bags aren’t worth it no matter how awesome they taste if I feel guilty about that plastic wrapper sticking around for decades after I’ve enjoyed them. 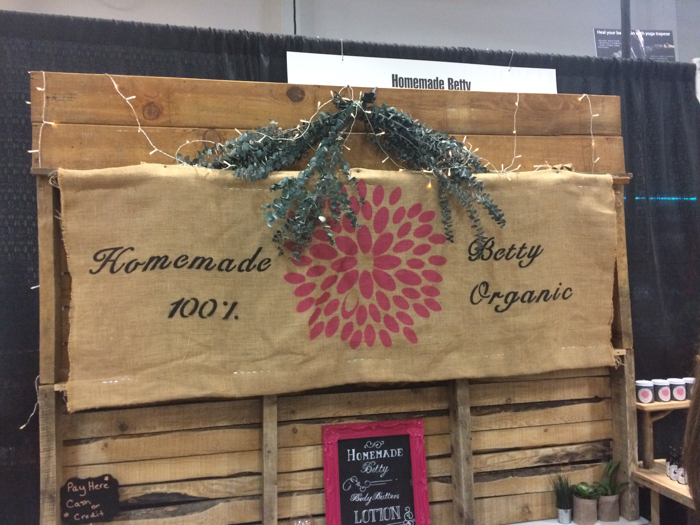 One vendor that seemed to have a plastic free inventory was Homemade Betty. Most if not all products were packaged in glass bottles or jars. 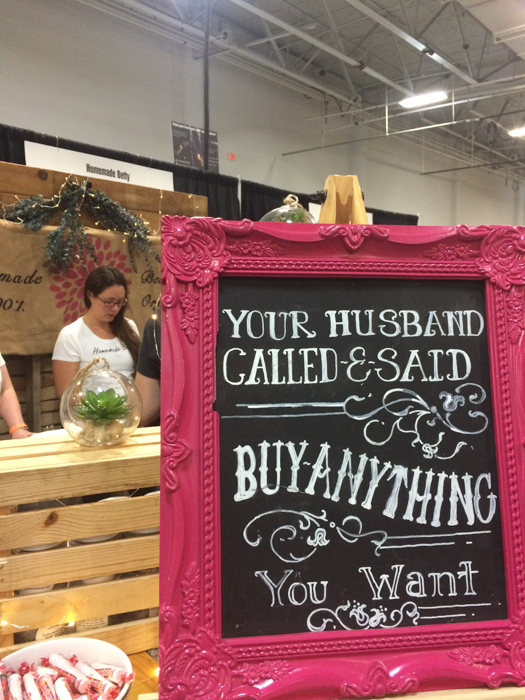 Her booth was even stylized with what I felt were reused materials like her repurposed table. I commend her for being conscious about her product packaging! The highlight of the event was to enjoy a Marty’s V Burger, however I felt it was rather dry compared to the first time I enjoyed one at the NYC Green Festival. Their Mac and Cheeze was very spot on with its flavor, which I did enjoy. I’ll always give them a try when they are available, since their burgers are such a treat. This event location was a way better space than last year. I just wished it was more local like it had been the first year, but that’s just my personal preference to not venture to densely populated areas. 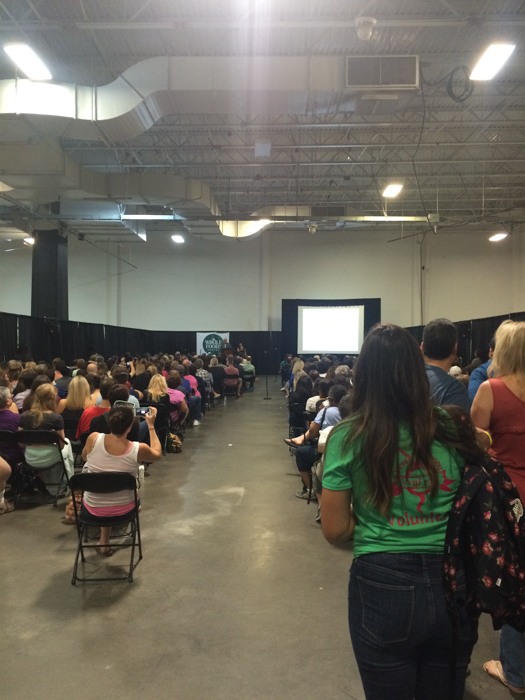 I hope the Vegfest continues to grow into a bigger and better educational event each time it is hosted. Check out their next large event in Atlantic City, July 14, 2018 and be on the lookout for their upcoming smaller pop-up events in November, December 2017 and January 2018 . Wow, New Jersey VegFest looks wonderful this year. Very well written.